OK, surely this classification of Happer et al. as a "kangaroo court" and the opponents of his science "educated adults" comes from someone who is a science expert, right? So Mr Kerry, you have a science degree, don't you? Kerry admits that he has a "Bachelor of Arts" degree from Yale (1966), it's a political science degree, but he suggests it is "liberal arts" so it could include everything, including sciences. This suggestion that "it should be basically counted as science" is the main reason why I consider the subsequent summary by Massie to be perfectly appropriate: "We should know that someone who has a pseudoscience degree came here to tell us something about pseudoscience." That's exactly what was happening. Kerry's comments about CO2 and stuff like that aren't comments by a scientist who actually knows what he is talking about. They are comments from a political scientist and a career politician who was also trained to use some scientific terminology to pretend that he's connected with science. But the connection is just a fabrication, a P.R. trick to impress a certain subset of voters. Because Kerry pretends his kind of thinking and argumentation as "science" although it's clearly not (political science isn't science), it's appropriate to call it "pseudoscience"! Kerry immediately asks: "Are you serious?" He is simply not used to the fact that someone dares to point out that his credentials to talk about science – let alone pretend that he is scientifically above Will Happer – are non-existent. Kerry is used to sycophants who don't understand any science themselves but they also root for the same political programs, the same pseudoscience, and the same distortion and abuses of scientific facts. But again, America still has legitimate lawmakers like Thomas Massie, you know. When questioned who was really called a "kangaroo committee", Kerry pretends that he doesn't know who was the target of this description because "it's a secret". So if he doesn't know anything about the composition of the committee, how can he make a statement that it is a "kangaroo committee"? And if the Trump administration preserves some confidentiality, isn't it a justified policy given the fact that John Kerry is ready to attack the committee even if and when he knows nothing about it? The attacks would certainly be stronger if he knew details. OK, the political science bachelor Kerry tells the robotics engineer that "it's not science" while Massie semi-jokingly says "you're the scientist here, you have the political science degree". Massie asks Kerry about the concentration of CO2 and Kerry answers 406 ppm. Impressive, I have expected him to fail this elementary school exam. Too bad, he immediately added the pseudoscientific nonsense that "according to science, 350 ppm is dangerous". No competent scientist believes any superstition of this sort. The number 350 ppm was just a number more or less randomly chosen by Bill McKibben to promote a Luddite agenda (350.org). Well, the number also appeared in papers by authors that have been scientists, like Hansen, but they wouldn't go far enough to summarize the importance of 350 ppm in this ludicrous way, and even if or when they did, it was just when they acted like activists just like McKibben, not as scientists. Statements like "350 ppm is dangerous" are simply indefensible among real scientists, in real scientific journals that have defended their independence from politics. The statement is ludicrous and doesn't even mean anything well-defined (what is at least roughly the danger supposed to be?). Scientists just don't talk in this vague way that substitutes random numbers into random emotional sentences. Massie said "wow" to the pseudoscientific statement that "350 ppm is dangerous" and asked whether Kerry was aware of the fact that the average concentration of CO2 in the "era of mammals" was above 1,000 ppm. Kerry agreed but said "we weren't walking the planet" and promoted recent 800,000 years instead – CO2 wasn't higher than today in that interval. Now, "we weren't walking the planet" is exactly the "counter-weapon" that only people who deliberately deceive others; or people who seriously misunderstand basics of science may offer as "relevant". What does it mean "we weren't walking the planet"? Who is exactly "we"? Aren't "we" just citizens of the U.S.? Homo sapiens? Anyone from the homo genus? Primates? Mammals? Vertebrates? My point is that each of us belongs to many sets – all of us belong to many of the "same sets" – and none of these sets is automatically "more relevant than others". When we talk about the impact of the climate on our life, it's clearly meaningless to distinguish citizens of the U.S. from non-citizens because they respond to the climate similarly. But it's also meaningless to talk about "homo sapiens" because the climate has affected homo erectus – and even other primates and the bulk of mammals and others – in virtually the same way as it affects us. Our ancestors diverged from monkeys some 6-8 million years ago. Apes diverged from monkeys some 25 million years ago. 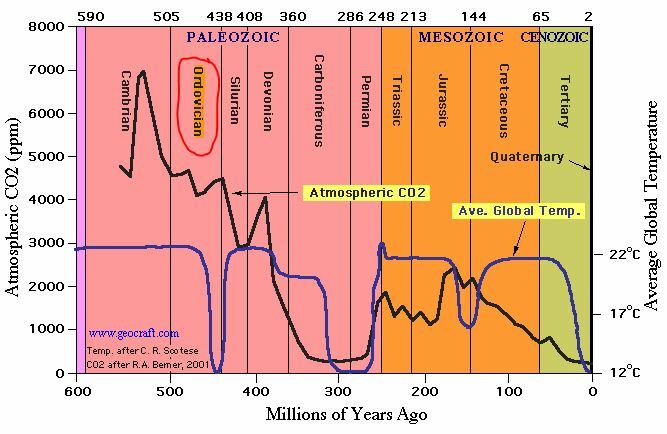 At that time, the CO2 concentration was higher than today – our ancestors who walked the Earth were biologically commensurable with us. But even the primates and mammals might be too narrow groups in a discussion about the climate because the modern humans' ability to withstand certain temperature ranges doesn't differ from the ability of many completely different species of organisms. Many other groups of organisms with a similar range of tolerated temperature as modern humans were walking the planet – and even this modest observation is enough to see that there is nothing dangerous about 1,000 ppm. Your puppy can survive similar temperatures as you, can't it? And the evolution of dogs started 40 million years ago. Or even better, using Sexmission: Look at the stork! If it could live in that atmosphere, so can we, we're saved! ;-) Birds have evolved for 225 million years – so they have seen over 2,000 ppm of CO2, too. So the statement that "we" didn't walk the Earth is both ill-defined – because the definition of "we" is unclear and arbitrary – and irrelevant for the question whether the CO2 concentration above 400 ppm is worrisome. Now, Kerry started to emphasize the "recent at least 800,000 years". Quite generally, a sensible listener would immediately ask "Why did you choose 800,000 years? And what was before?" (Too bad, millions of people are insufficiently critically thinking to produce these next questions.) And the obvious answer is that he chose the maximum number for which his would-be scary statements hold – and they just didn't hold before that. And quite generally, this obsession with 800,000 years and the assumption that it "looks extremely long to the listeners" is a symptom of a non-scientific atmosphere. A scientifically literate person knows that the age of the Earth and the age of the Universe are 5,600 and 17,000 times longer than 800,000 years, respectively. Recent 800,000 years is a tiny fraction of the history of life on Earth, too. The mankind is almost certainly the most impressive species that evolved in recent 3 million years or so – which is why it's not unreasonable to expect that the concentration of some gas partly associated with the human activity could also be the highest in a million years or so. To make himself look like a real authority, Kerry said that he was taken to the South Pole or something. And he saw a box with a 401.6 ppm clean air. Is that impressive? Only a non-scientifically, basically religiously thinking person could attribute any importance to this kind of a testimony. It's completely irrelevant whether Kerry was taken to the South Pole. It's completely irrelevant whether he saw a vessel with a "clean air" label. Regardless of these deep perceptions in Kerry's life, it's still true that every human may live in 5,000 ppm of CO2 without any problems whatever. Even if Kerry has made some original observation during his trip to the South Pole, as an experimenter, it would be largely irrelevant because he hasn't been there before the industrial revolution – so he couldn't really compare whether there was anything new or special about the conditions that he observed. Massie says that Kerry picked 800,000 years because he cherry-picked the periods and the CO2 was higher before that. Kerry emotionally responded by saying that it was just a different world – without 7 billion people. Again, this is a sign of his totally unscientific thinking about these matters. The world that existed a few million years ago simply wasn't "a totally different world". The masses and orbits of Earth and planets were virtually identical. More importantly, most of the species we know have already looked almost indistinguishable from the present ones. The forests in many regions looked almost identical as they look today. Our ancestors looked more primitive than us. If we focus on social dimension of the world, the human outfits, technology, society, civilization, our world is very different than the world that existed a few million years ago. But these social dimensions are exactly those that are irrelevant for the discussion of natural effects such as the greenhouse effect and its influence on living organisms. These effects and influences simply don't depend on our culture (except for our ability to turn on heaters and air-conditioning etc.). Instead, the higher concentration of CO2 was obviously affected by the existence of 7 billion people. But this is a justification why the higher concentration should be expected for good scientific reasons, and therefore considered "normal". It is not a reason to think that there's something dangerous. Now, an excited Massie asks how it's possible that the CO2 was higher when the humans weren't around – a fact Kerry had just admitted. Kerry admits that there were all kinds of geological processes – a nice surprise that he was capable of sketching this correct answer (that he would never dare to say actively, without a question that pushes him to think). Massie predictably asked "did the geology stop when we got to the planet?". And Kerry responded that "it was simply not a serious conversation". It simply is a serious conversation – the only problem is that the likes of Kerry have never participated in one because they always shut down any conversation at the moment when it got serious, or earlier. Again: The point of Massie's question is that there have clearly been many processes and mechanisms that have been changing both CO2 and (especially) temperature on Earth, most of these mechanisms are natural and independent of humans, and they still exist. It's simply a denial of science to start to think about ongoing phenomena as "climate change" as if they were a purely social or political construct, a function of our political decisions. They're demonstrably not a social construct. The mankind can't control the global climate. There is no climate control knob, as Tom Nelson loves to say 50 times a day. At most, we are contributing something to the temperature change. But if the relationship had a clear attribution, every scientist would see it and agree. There's a rather clear attribution of the rising CO2 – which isn't dangerous by itself – and people agree. We emit 4 ppm worth of CO2 a year (over 30 billion tons), 2 ppm out of it gets absorbed by the increased absorption-to-emission gap, while the other 2 ppm are left in the atmosphere as an increase of the CO2 concentration. There's no easy attribution of the temperature change in recent centuries (which has clearly lots of "noise" that we can't calculate). That's really the essential point and that's the reason why "policies to fight the climate change" are scientifically unjustifiable. Everything else that the likes of Kerry say and do is just the obfuscation of relevant facts, misinterpretation and hyping of irrelevant facts, promotion of misleading memes, cherry-picking of data and periods, and general manipulation with the public in general. It simply isn't what a scientist does about any of these facts which is why it's right that Donald Trump has named some real scientists to his bodies of advisers – not just "scientists" who say what the likes of John Kerry want to hear! In the final minute, Massie asked what to do about the Paris Accords and Kerry promoted the carbon pricing and the elimination of "tax cuts for the rich 1%". This is quite typical because the latter is a purely general political question that has clearly nothing to do with the scientific question about the CO2, temperature, their dynamics, and hypothetical threats resulting from it. Massie said "you don't want to politicize it but you just played the 1% card". Exactly. This mixing of the climate discussion with some populist comments about "1%" (where Kerry clearly belongs) is undoubtedly politicization of the issue. Kerry said it was a "moral card" blah blah. One may always say such things but the "moral discussion" of a specific kind is also a politicization of the climate debate. Massie says that the costs of the "fight against the climate" would primarily harm the poor. Kerry spreads a fairy-tale that "if you do it right, people at the bottom are rewarded". It's just a self-evident falsehood. A big part of the 7 billion that he considers a climate problem are poor. So if he forces them to use expensive energy sources etc., it will clearly make their lives harder. If you make the poor people richer by a deeper redistribution, they will also start to emit more CO2 because their relative poverty is a top reason of their relatively lower CO2 emissions. Clearly, a working reduction of CO2 primarily means to keep the poor people poor, or to make them even poorer. This equivalence is almost a mathematical theorem. As you can see, a serious discussion between the rational people like Massie and the likes of John Kerry isn't really possible. Massie talks about things that are relevant, from an impartial perspective, he always analyzes arguments, what is their purpose, whether they're not cherry-picked, whether there aren't more important things that you should actually start with if you analyze a certain broader question generally. On the other hand, John Kerry and similar people are used to emit verbal fog, cherry-picked, untrue, mostly irrational, and emotional memes and mix them in whatever way seems convenient to manipulate the masses in a politically predetermined direction. And whenever someone actually localizes the problem and starts to look carefully at the data and arguments, Kerry screams "it is not a serious conversation". Massie represents the rational and scientific attitude, Kerry represents the anti-scientific and demagogic attitude.